BLADE RUNNER, 1982. 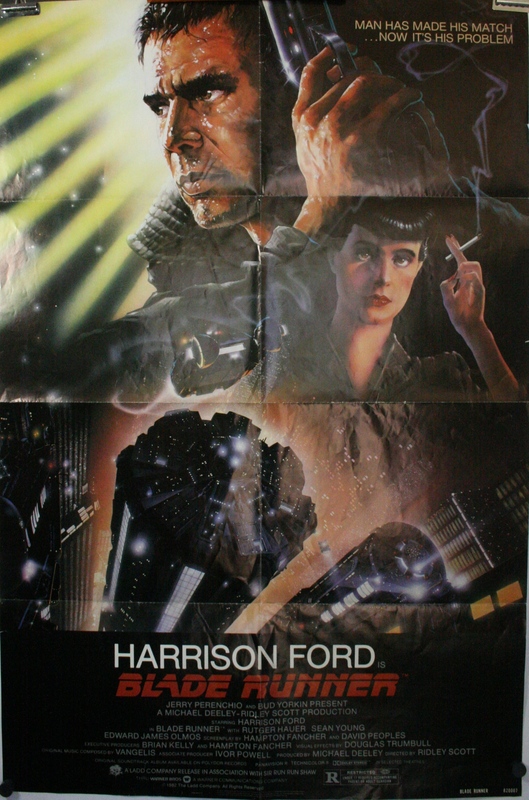 Original 1 Sheet Movie Poster starring Harrison Ford, Rutger Hauer and Sean Young. This futuristic adventure story directed by Ridley Scott is perhaps best known for its heavy atmosphere in a rain soaked insanely crowded post apocalyptic urban hell – and you thought LA was bad in rush hour! Harrison Ford stars as a cop gunning down Replicants. Great movie and a fantastic poster sure to continue to appreciate in value. The colors are vibrant throughout but there is some color loss and wear along the fold lines.